Let me introduce myself. I am Raymond van Hoorn (on MSX forums and IRC known as ray2day). I am 44 years of age and I am married to Maartje Huijink. My profession is graphic designer / desktop publisher. I am an active MSX user and collector. In 1987 I got my very first computer; a Philips MSX2 computer the NMS 8245. I spend a lot of time on this machine programming basic and playing games during my youth. Also it was pleasant for me to work with programs like Designer Plus and Dynamic Publisher, one of the main reasons I became a graphic designer I think. Later I started to work with Apple computers and the MSX was moved to the attic. 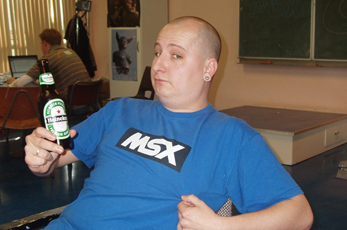 In 2005 I went just for fun to the MSX fair in Oss. It was funny to see there were still people using that old MSX computer. Crazy it was. I never thought it would be something for me. But later that year I saw a MSX for sale on a flea market; a Philips MSX2 computer the NMS 8245. Simulair to the MSX I had backin the past. The lady who sold it asked just ten euros for it... so I couldn't leave it standing there. My enthousiasm for MSX got a seccond life..
At the moment I still go to flea markets and I'm still looking for MSX stuff, but nowadays for my collection. I also search active on the internet for stuff. I visit the Mariënberg MSX club day every month and next to that I visit MSX events like the MSX fair in Nijmegen.